Mexico City. During a visit to the National Mexican Red Cross Collection Center, President Felipe Calderón announced that Mexico will make a special donation to Haiti of eight million dollars, which will be channeled through the United Nations Organization. “In addition, Mexicans are donating eight million dollars, over and above what you are doing, which is very valuable, and means far more and is more generous,” he said. 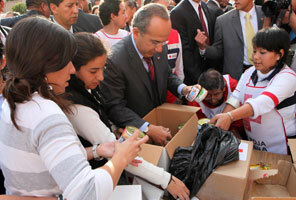 Accompanied by his wife, Margarita Zavala, the President closed the doors of a trailer containing donations that will be sent to the Caribbean island. He also urged society to continue with its donations, particularly medicine, dressing materials and personal hygiene items.